Liverpool remains in the chase, for the current two-horse title race. Klopp’s men become a laughing stock, a two-nil defeat was quite a shock. Rolling back the years, a glorious era ends in tears. The Good, The Bad and The Ugly. Another week reviewed at the world’s favourite football club, Liverpool FC. Liverpool are holding up in the stare down with Manchester City. For those who can’t join the dots, this means the battle at the top of the Premiership. Chelsea drew against Everton yesterday, but the Reds emerged victorious against Fulham. Keeping up the see-saw race for the number one spot. A thoroughly professional performance from Jürgen Klopp’s team. Nothing spectacular. 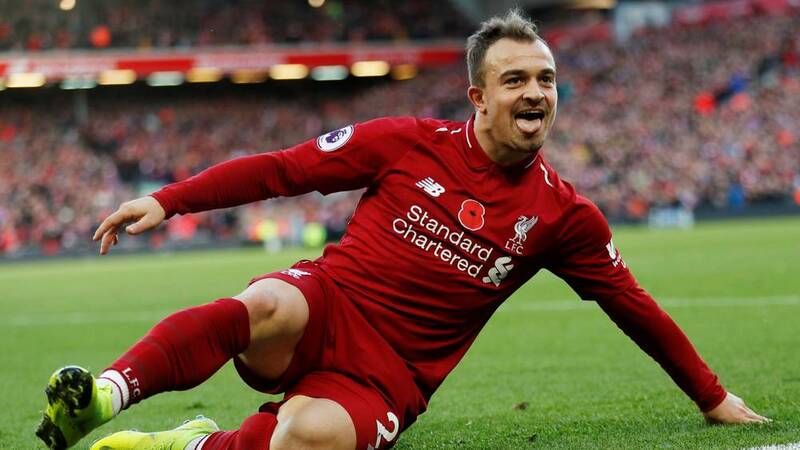 Just goals from Mo Salah and Xherdan Shaqiri was enough to secure the points. As I said, not a jaw dropper by any stretch of the imagination, simply put an example of an efficient, well-maintained machine going about its work. Special mention for Fabinho who continues to grow into his role between defence and midfield. A solid performance from the guy who forgets his song lyrics. It’s a good job he doesn’t fluff his lines on the pitch. Not a top of the table tussle, but nonetheless three precious points to keep the pace with Manchester City. The Cityzensswatted their neighbours Manchester United 2-1 to remain top. Currently, Liverpool are matching City stare for stare and one has to wonder who’s going to blink first. The loss to Red Star Belgrade during the week. God-awful stuff that was. I was actually quite bullish ahead of the game. I’d even go so far as to say sarcastic. And well, did the boys from Serbia shove it up my nose? What a poor result? Shock doesn’t come close. Was the team rattled by the “warm” welcome they received in the Rajko Mitić tunnel? Or did the hosts simply do their homework and thwart Liverpool’s game? I’d say the latter. They simply shut the Liverpool from three of Daniel Sturridge, Sadio Mané and Salah our of the game. Period. A deserved win for them but a totally rubbish outcome for the Reds. Now the team needs positive results from their last two Group C fixtures to qualify for the knockout stages. As usual, knowing Liverpool, it’ll come down to the last minute of the last game. Better get the beers in… and the Valium! Some 20 years ago today (12th November), Liverpool parted company with Roy Evansin a tearful press conference at Anfield. An experimentwhich had gone horribly wrong. It was a sad day. Not just for Mr. Evans but also for Liverpool fans. The last member of the legendary “Boot Room”, which included the likes of Bob Paisley, Joe Fagan and of course Bill Shankly. Evans became Liverpool manager after Kenny Dalglish and Graeme Souness, but both would admit, the ex-player and coach was a part of the fabric that made Liverpool a formidable force in English and European football. The team he had in the mid-1990’s which included the likes of Robbie Fowler, Steve McManaman and the mercurial Stan Collymore was for me, one of the greatest Liverpool sides in living memory. I was at Anfield the night Stan Collymore scored the winner against Newcastle in that famous 4-3 thriller. The one that left Kevin Keegan slumped over the advertising hoardings. A match which was only bettered by the Istanbul result in 2005, in my opinion. I have never since or before witnessed an atmosphere like that at our famous old ground on Walton Breck Road, L4. Why Ugly? Well, to this day I felt Evans was made to be a fall guy. The club seemed intent on recruiting Gérard Houllier as manager but were too chicken-sh%t to oust one of the club’s greatest servants. Fortunately for the hierarchy, they got their way when he resigned. It’s unlikely the club will ever be the same since those days. Perhaps that’s for the better, perhaps for the worst. In any case, that was a sad day. I’m just glad Houllier was able to go on and achieve the success Roy deserved. Next up, we have another break in the proceedings to endure two more international games. First England vs the USA on Thursday and then on Sunday, we have England versus Dejan Lovren… or Croatia. After that, back to business, with a potential banana-skin against Watford at Vicarage Road. For Career, Business and Life Coaching, check out www.mycoachben.com for more details and to arrange a confidential chat. You deserves the best!